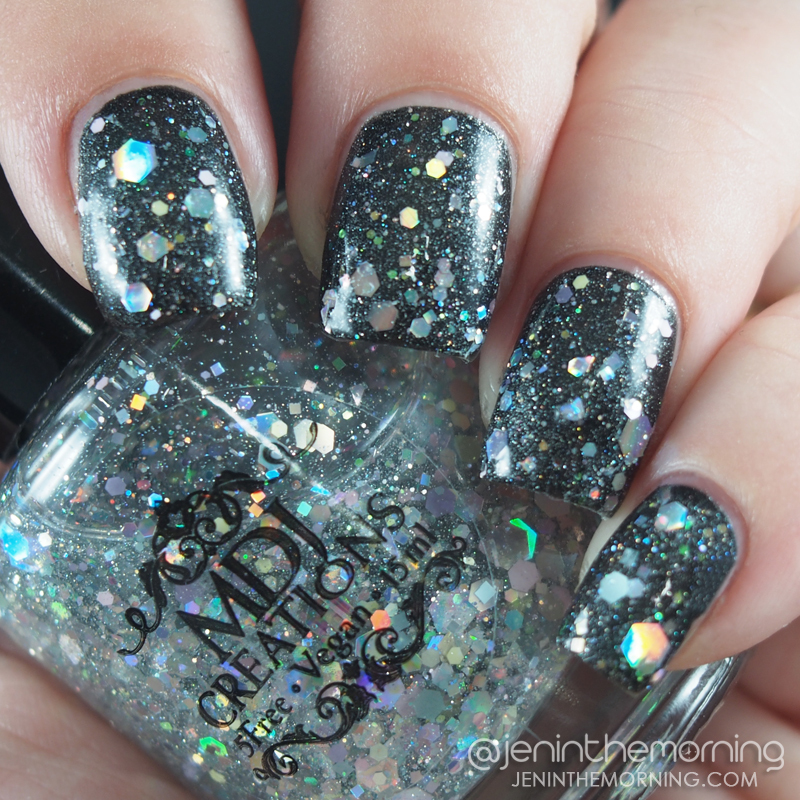 A few weeks ago, I caught an awesome sale by indie polish seller MDJ Creations and purchased a couple of full bottles of polish. She has some amazing selections but I ended up going with Fire by Night and Future Tech Wizardry. I had not originally intended to do a full review but guys, I am IN LOVE! I’d used Fire by Night before, but only as a topper and not as a full manicure. Seriously, these polishes are really fantastic. I’ve been completely charmed by this brand, so I am going to get right to my review. These polishes are 5-free and have really good formulas! 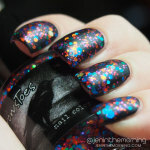 This polish is a holo topper made up of pure, holographic love. It has large, medium and small hexes. It has little micro flecks and micro glitter. I’m pretty sure it is made of awesome. The glitter is dense and no fishing needed to apply! Application was very nice and smooth. I dabbed a little bit just to get glitter where I wanted it, but I didn’t have to do any crazy or annoying fishing to get the glitter I wanted. 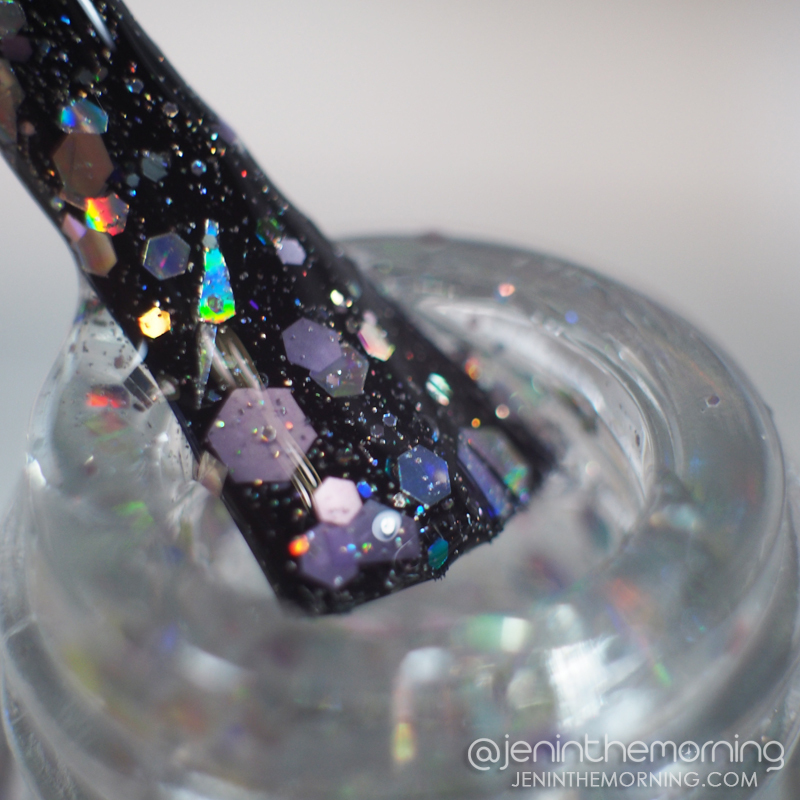 Pictured below is one coat of Future Tech Wizardry over Sinful Colors – Secret Admirer. It totally looks like there are gemstones on my nails! 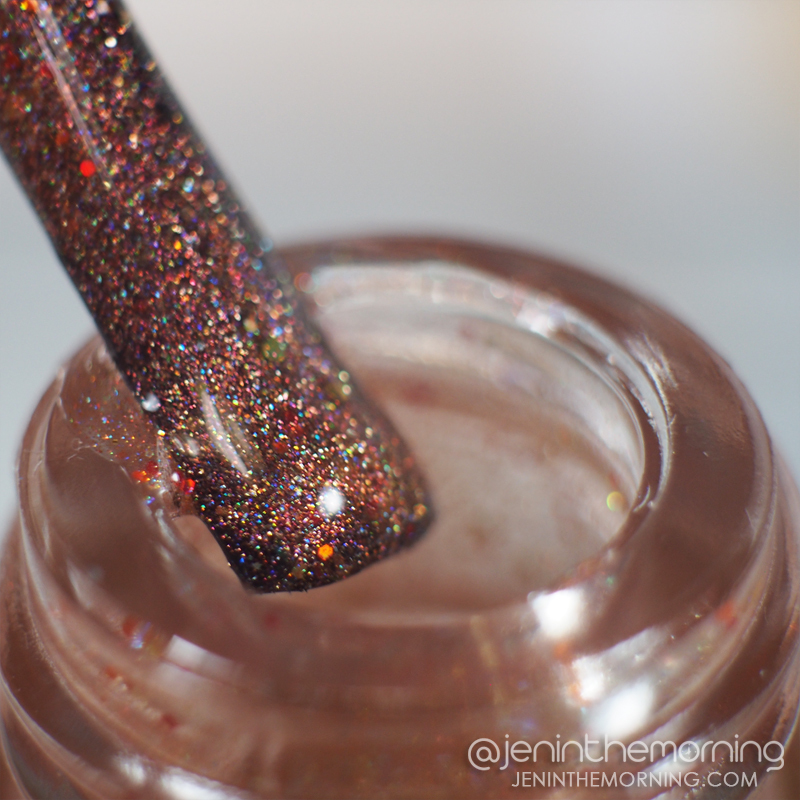 This polish is a golden-coppery linear holographic with slightly larger bits of scattered holographic glitters. 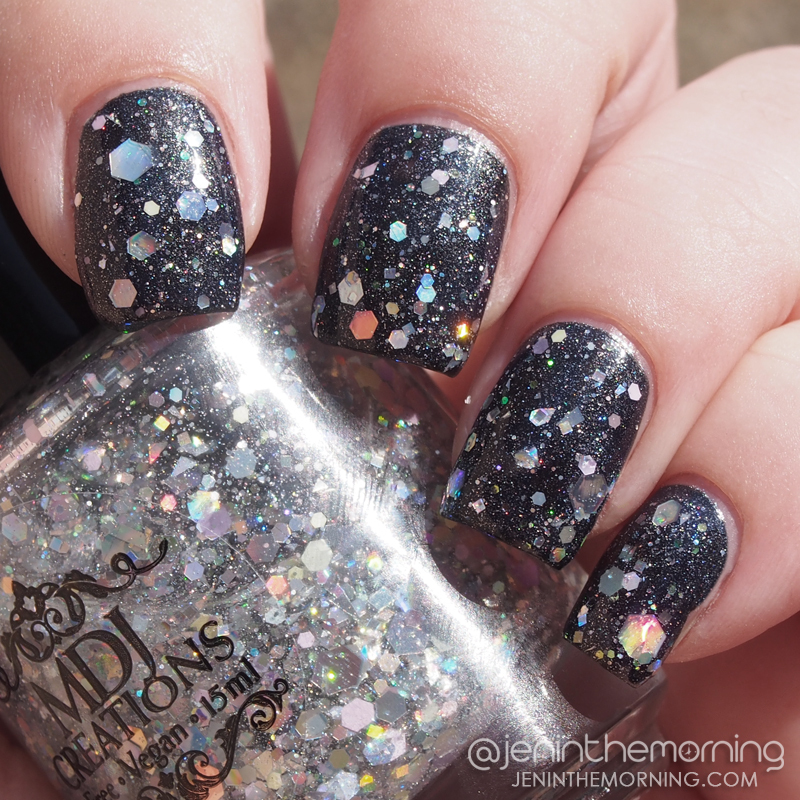 It reminds me a bit of ORLY – Mirrorball. The color is really magnificent and the name is a perfect description for this warm color. Like Mirrorball, Fire by Night takes several coats to get fully opaque. The formula is fantastic though and goes on very lightly and smoothly. I used 3 coats for full opacity, but the formula is so fine and thin that it feels like one coat. So here is the first part of my love: it is a dream to apply! The second part is the way this polish looks. It has a gorgeous inner glow and as you move your fingers you get intense flashes of light. It is really stunning! My pictures don’t capture how gorgeous this is! Movement makes this simply amazing to wear! Here is the gradient I did using this amazing polish as a topper. With one coat, you can add some gorgeous warmth and flash to your manicure. I love both of these polishes but Fire By Night has moved into my top 5 and will easily be one of my go-to polishes if I only have time for a single color. Future Tech Wizardry is totally versatile and because it is made up of all holographic glitters it really will go well with any base color! I totally recommend both of these polishes and think everyone should own both of them! 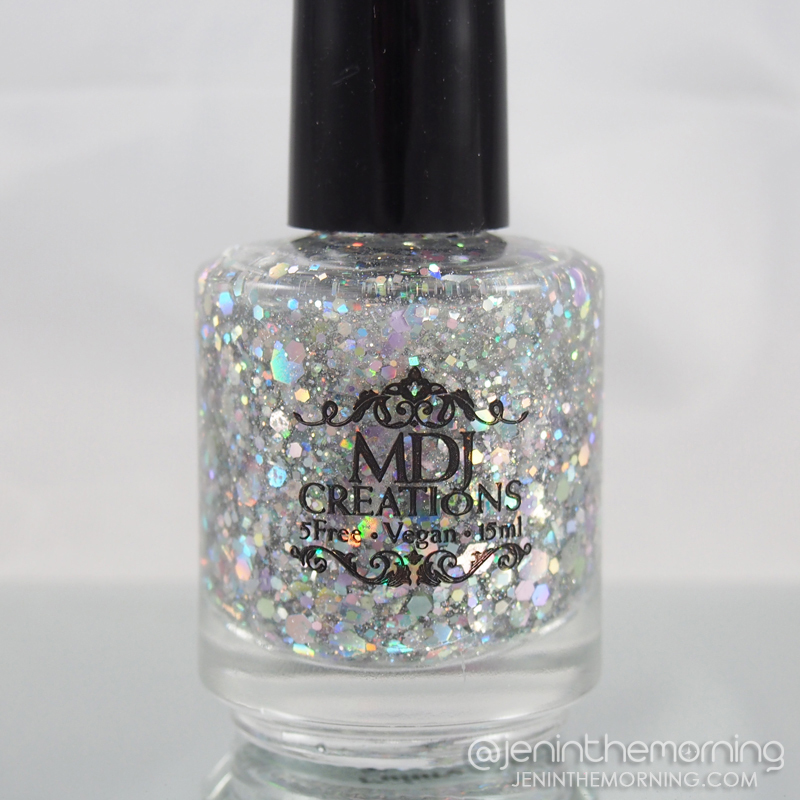 MDJ Creations – Swatch and Review – Polish Variety! Great post and lovely swatches! Gorgeous swatches! Love the gradient mani! I absolutely love MDJ Creations! I have probably 30 of hers, all gorgeous with spot on formulas. I think it’s one of those brands that could easily be at the top but doesn’t get the credit it deserves. Fire by Night is STUNNING!! Love the gradient! Oh that gradient! Its like a bronzy sunset. I really love your swatches super pretty! Fire By Night is so you! I love the swatches, Jen. The mani you did in the end is drop dead gorgeous. Love these! Your gradient is beautiful! Fire by Night is gorgeous! I love how it looks over the gradient. I must know what that Zoya is. I think I own it, but I must be sure–and you gradient is awesome!!! That sunlight photo of Fire By Night is the money shot!! Wow! I love what you did with your gradient too! SHUT UP! Fire by Night over that gradient. Kill me now! Wow, I can’t believe this indie has not been in my radar. 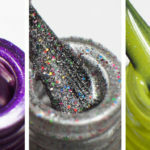 I would love to see that glitter topper over a bright red creme! Those polishes are both gorgeous, but I really love Future Tech Wizardry. Great swatches Jen. Lovely swatches! I totally agree with Future Tech Wizardry, totally looks like gemstones!